Astronomically speaking, autumn begins with the vernal equinox, which will occur on September 22. However in my yard, autumn’s influence is showing more every day. But at the same time, summer has not surrendered, thanks to frequent August rains and high temperatures that have not ventured near the record heat wave that plagued us during much of July. In the last few days, our first round of autumn air has chilled our mornings, leaving heavy dew on grass, leaves, and garden benches, and bright blue, humidity-free skies that beckon birds to start thinking about their southerly migrations. 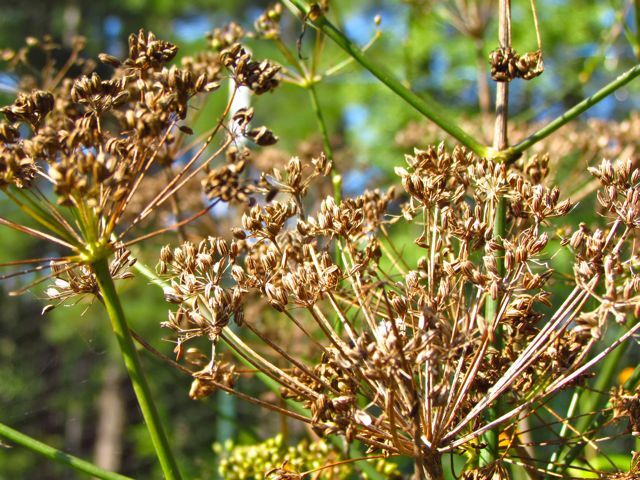 The late-summer rains have confused some of my plants — like the Florida Anise-tree in the opening photo. While still ripening the abundant fruits it produced from its spring flowers, it has put out quite a respectable second flush of new flowers. All the trees — red- and white-bloomers are doing this to some extent. The annual flowers in my vegetable garden are also reinvigorated, looking nearly as lush as they did in June — quite unusual in recent summers. But most plants are well into seed-production mode. 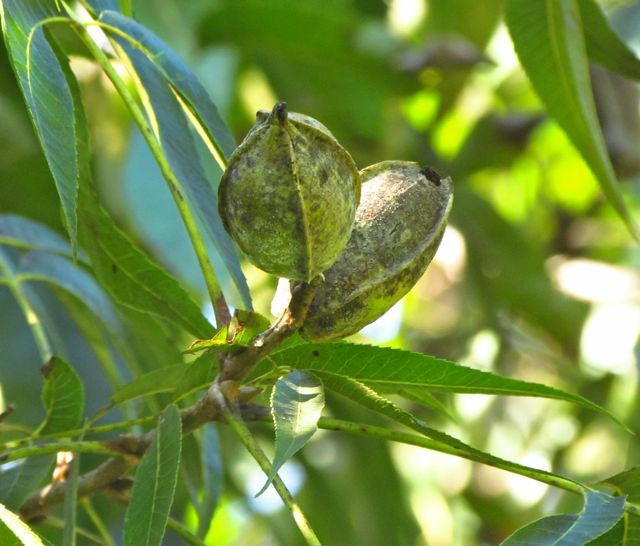 My pecan trees this year set abundant fruit, but I suspect the July heat wave damaged them. 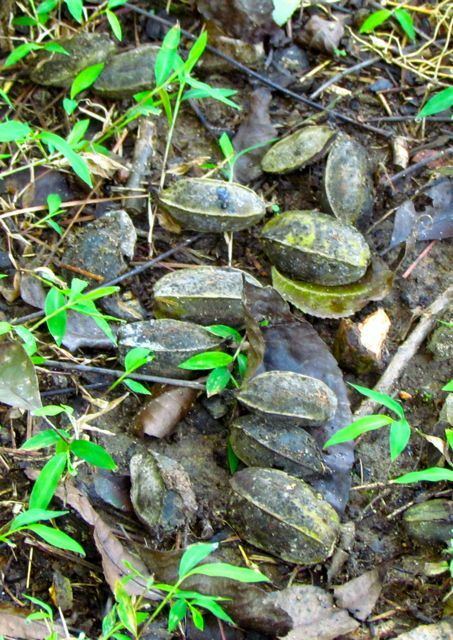 Instead of being harvested and devoured by squirrels, most of the nuts have fallen to the ground. A few look as if the squirrels tasted and rejected them. Pecans fell prematurely and are being ignored by squirrels. Perhaps the squirrels will approve of these? The bronze fennel I grow in the vegetable garden as food for Black Swallowtail caterpillars were not visited by those butterfly larvae this year. Instead, they bloomed prolifically, and now their seeds have ripened in abundance. I predict a bumper crop of fennel volunteers in my garden next spring. I hope the birds eat some of these, or I’ll be growing a fennel garden next year. Fruit set on the native trees is abundant. 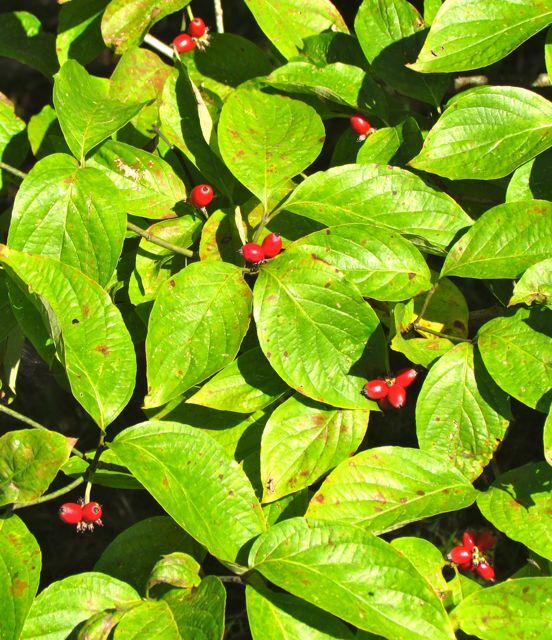 Pileated woodpeckers are arguing daily over dogwood (Cornus florida) berries, which turn scarlet well before their leaves. By the time the leaves turn, the fruits will all have been devoured. 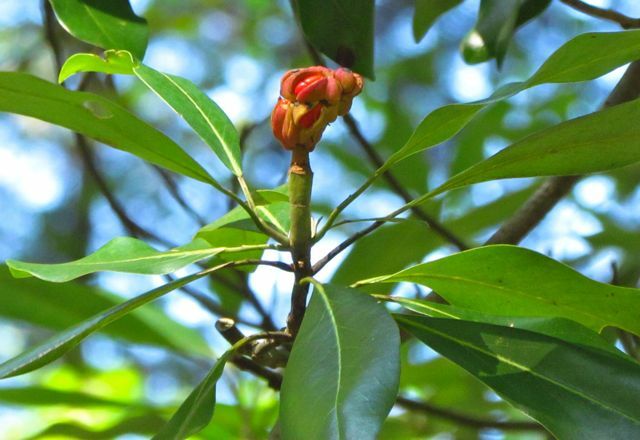 Although shorter than cones of sister species, it is still unmistakably a Magnolia fruit. Local wildlife seems to be working overtime as winter’s cold looms closer. 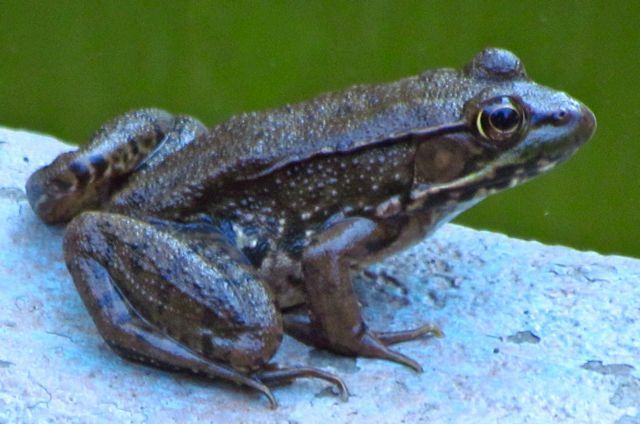 Last week, I had noticed that a few tadpoles were still lingering in my little water feature. 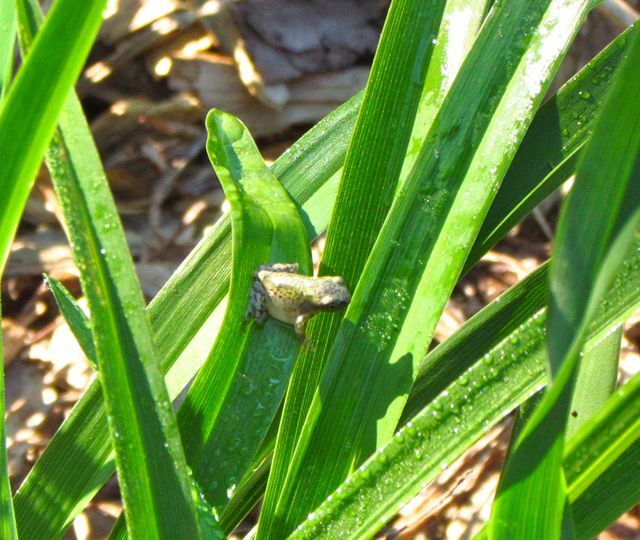 This morning, when the thermometer on our hill read 49.3 degrees Fahrenheit, a new froglet emerged and settled on a dew-covered leaf. These little ones never photograph well for me, but I think perhaps it’s another Cope’s Gray Treefrog. I hope so. Warming up in the first rays of morning sun. Two hours later, one of the Green Frogs that’s been living in the water feature all summer emerged seeking sun. These frogs have more than doubled in size since they first arrived after a rainy night. The Green Frogs have flourished this summer. The insects and arachnids seem to go into a near frenzy of activity this time of year, perhaps trying to squeeze in one more generation of themselves before winter’s cold shuts down production. 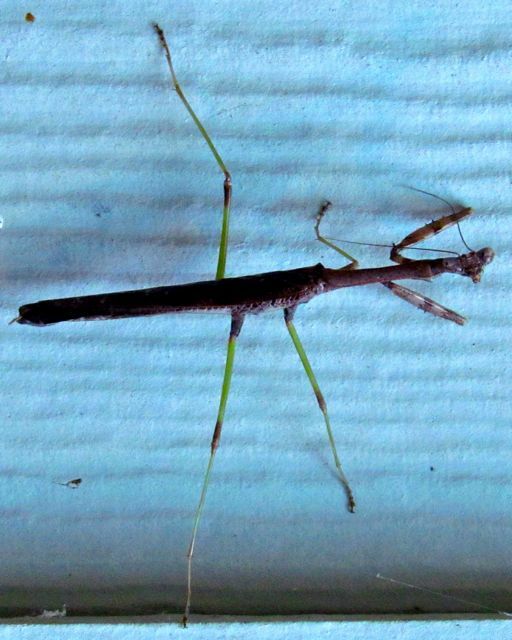 Two days ago, I was surprised to see a male Carolina Mantis on the wall beside my front door. I know he was a male, because he was so skinny that I at first thought I was looking at a very large Walking Stick insect. Then he turned his characteristic triangular head in my direction, and I realized my mistake. I haven’t seen a Carolina Mantis in my yard in maybe ten years. The Chinese Mantises were all I saw, and even they have been sparse this year, I think due to a lizard population explosion in my front garden. I suspect this fellow was looking for a mate, and I hope he found one. I’m all for helping our native mantises thrive. Click on the photo below to enlarge it enough to see that he was staring at me. This male Carolina Mantis lingered for about an hour before disappearing. Early inspiration for tattoos, perhaps? The mist from the water feature gives her a bit of a sinister air. 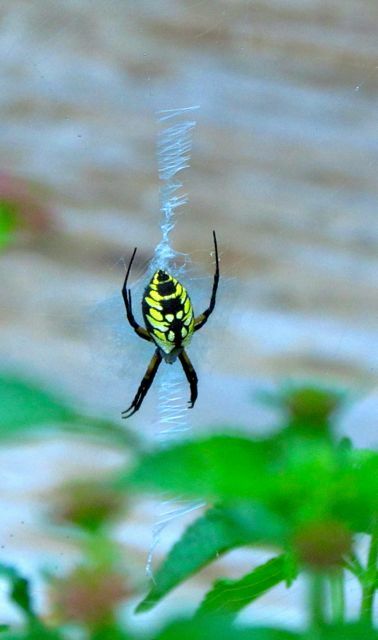 The other Garden Spiders that once resided in the plants that sit within my water feature have all vanished. But one left behind a very large egg case. Before I carry the water plants inside my greenhouse for the winter, I’ll gently relocate this case to a spot in the garden where the hatchlings will be appreciated next spring. Note the messy web left around the egg case — a defense perhaps? Finally, two caterpillars crossed my path this morning. Caterpillars are everywhere right now. I know this by the frass (entomologist jargon for caterpillar poop) littering my deck below the oak tree, and by the myriad birds that hunt for them in the trees all day. I’ve been hearing the chipping call of a patrolling Summer Tanager nearby for several weeks. 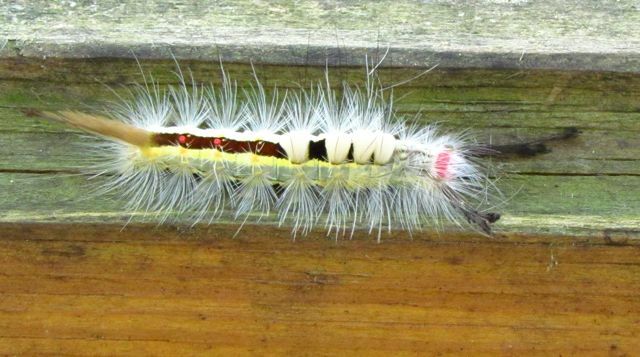 This intimidating caterpillar was on my deck railing this morning. Don’t touch those hairs. They will sting and give you a painful rash. This one likely fell from the oak tree above where I found it. This one and its siblings have been eating my native coral honeysuckle for a couple of weeks now. Honeysuckle is one of this species’ favorite food groups, and my vine is huge, so I let them have their way. 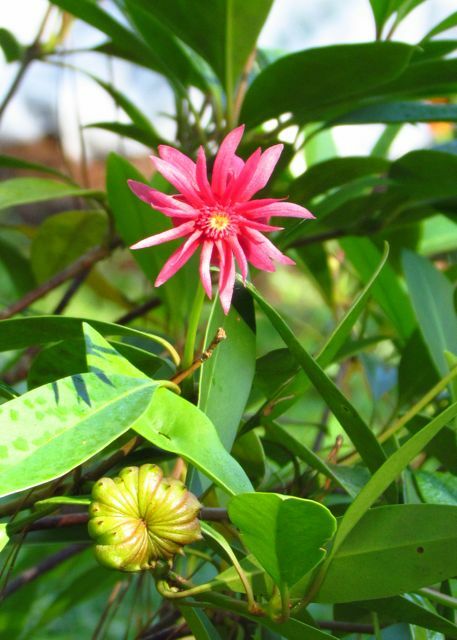 They don’t eat the flowers or fruits, merely stripping the vines of leaves in a few spots. Note the discarded skin on the branch behind it, left over from an earlier molting. How do I know the identity of these caterpillars? I’m glad you asked. 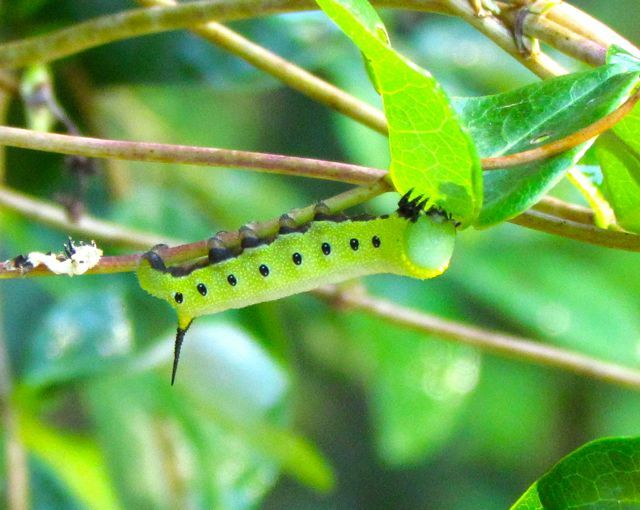 Everything I know about caterpillars I learned from my go-to reference — Caterpillars of Eastern North America by David L. Wagner. Dr. Wagner’s book is full of excellent photos and all the information you need to know about what the caterpillars eat and what they’ll turn into. I highly recommend this book. That’s just a sample of what’s going on right now on my patch of North Carolina piedmont. I’ll fill you in on some other highlights in another post soon. Meanwhile, get out there and enjoy that autumn air while it lasts. Word from the weather seers is that heat and humidity will be returning within 48 hours. But not for long — we hope! This entry was posted on September 12, 2012, 11:04 am and is filed under Favorite Plants, Native Wildlife, piedmont gardening. You can follow any responses to this entry through RSS 2.0. You can skip to the end and leave a response. Pinging is currently not allowed.